Virtue ethics focuses on the development of sound moral character rather than moral rules. In this theory, it is believed that having a virtuous character leads to virtuous decisions. Both teleological and deontological ethical theories are called deontic or action-based theories of morality. This is because they focus entirely on the actions which a person performs. Those theories focus on the question, "Which action should I choose?" Virtue ethics, in contrast, take a very different perspective. Virtue-based ethical theories place less emphasis on which rules people should follow and instead focus on helping people develop good character traits, such as kindness and generosity. These character traits will, in turn, allow a person to make the correct decisions later on in life. Virtue theorists also emphasize the need for people to learn how to break bad habits of character, like greed or anger. These are called vices and stand in the way of becoming a good person. Virtue ethics has not been a very common topic for recent study. It does, however, date back to the ancient Greek thinkers and is thus the oldest type of ethical theory in Western philosophy. 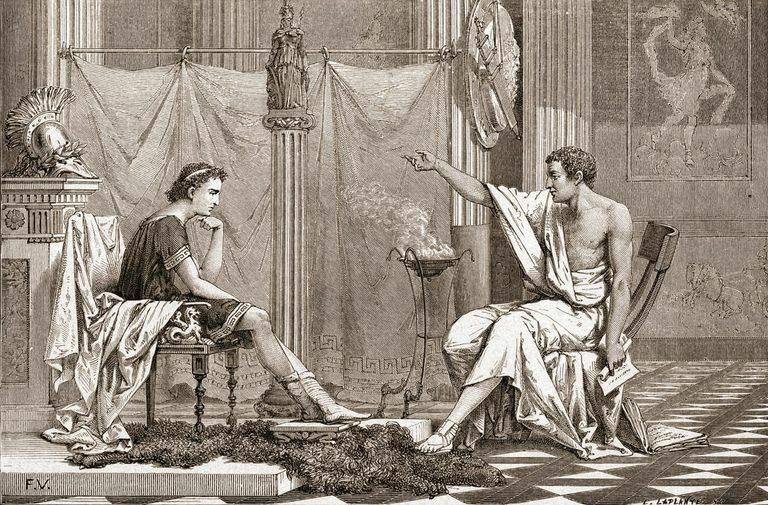 Plato discussed four key virtues: wisdom, courage, temperance, and justice. The first systematic description of virtue ethics was written down by Aristotle in his famous work "Nichomachean Ethics." According to Aristotle, when people acquire good habits of character, they are better able to regulate their emotions and their reason. This, in turn, helps us reach morally correct decisions when we are faced with difficult choices. Virtue ethics emphasizes the central role played by motives in moral questions. This is one reason why they can be popular and why they make an important contribution to our understanding of morality. To act from virtue is to act from some particular motivation. To say that certain virtues are necessary for correct moral decisions is to say that correct moral decisions require correct motives. Neither teleological nor deontological moral theories require motives to play a role in our evaluation of moral decisions. Yet, encouraging correct motivations is very often a key component of the moral education of young people. We are taught that we should desire certain outcomes and that we should want to accomplish certain goals by our actions. This goes beyond simply obeying the rules or seeking an optimal outcome. Other moral theories share a common difficulty not found in virtue ethics. This is the moral calculation of what actions to take or which moral duties to emphasize. On this matter, virtue ethics can be attractive. Virtue theories promise that once we are successful in creating the sort of person we want to be, arriving at the correct moral decisions will come naturally. What sort of person do I want to be? What virtues are characteristic of the person I want to be? What actions will cultivate the virtues I want to possess? What actions will be characteristic of the sort of person I want to be? The reality of virtue ethics isn’t as neat and simple as some might imagine. Many common moral decisions may indeed come more easily to a person of the “right” moral character. Yet, the fact of the matter is that many moral dilemmas require a great deal of careful reasoning and thinking. Simply having the right character cannot be enough to make the right decision likely, much less assured. The fact that rule-based and duty-based ethical systems are complicated and difficult to employ also cannot make a person of good character more likely to make the right choices. Another problem with virtue-based ethical systems is the question of what the “right” sort of character is. Many, if not most, virtue theorists have treated the answer to this question as self-evident, but it is anything but. One person’s virtue may be another person’s vice and a vice in one set of circumstances may be a virtue in another. Some advocates of virtue ethics suggest that we determine the right virtues by asking a virtuous person, but that is just an exercise in question begging. Others might suggest asking a happy person, but that assumes that happiness and virtue always coincide. This is by no means an obvious truth. Perhaps a key to understanding virtue theories of ethics is to regard them as ways to approach moral psychology rather than moral epistemology, or knowledge. What this means is that virtue theories should not be contrasted with theories about how to make moral choices, like the teleological theory of John Stuart Mill or the deontological theory of Immanuel Kant. Instead, virtue theories of ethics should be treated as ways to understand how we become moral creatures. In addition, how we develop the means by which we make moral decisions and the process by which moral attitudes develop. More importantly, virtue theories may be able to teach us how morals themselves should be taught. This is particularly true in the earliest years when the more complicated decision-making processes are not yet possible.